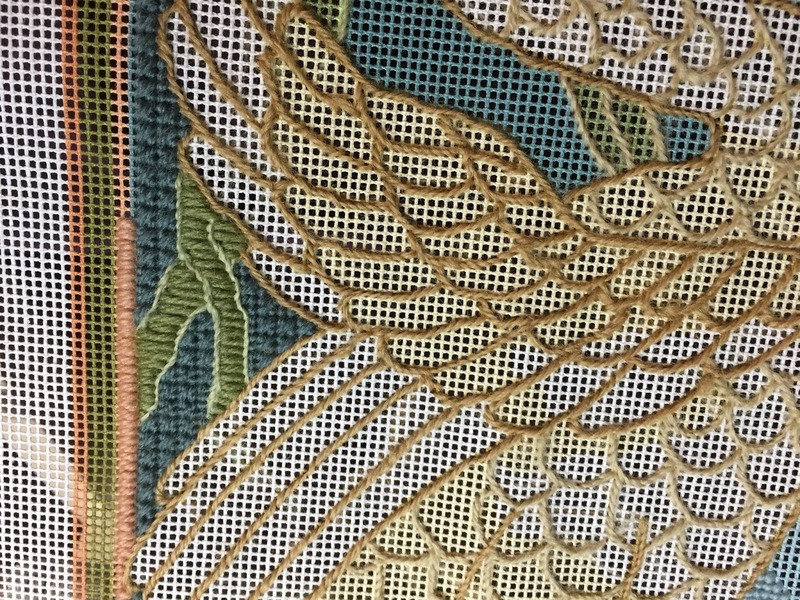 It doesn't feel like a ton of progress, but I did finish stitching the feather outlines, as well as the outline of the swan. The outlining is always a bit boring, but I know it will make the rest of the project go much more quickly. 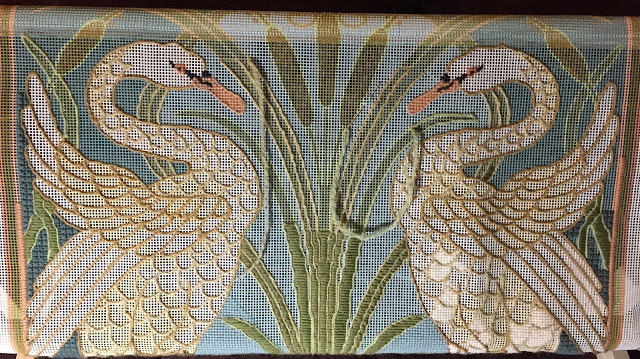 And I stitched the beak and the eye of left swan. This one is also pretty grumpy looking. In the next three weeks I want to finish ALL the outlining of the leaves, figure out some sort of textured stitch for the heads of the cattails, and stitch the insides of the leaves. If I need a break from that, I'll work on the outer background. In the meantime, check out the great work my fellow stitchers are doing -- including our two new members. If you're interested in joining and getting some serious support and inspiration for your projects, visit Avis's blog for all the details. Avis, Claire, Gun, Carole, LucyAnn, Kate, Jess, Sue, Constanze, Debbierose, Christina, Kathy, Margaret, Cindy, Helen, Steph, Linda, Heidi, Jackie, Hayley, Megan, Catherine, Deborah, Connie, and Clare... and welcome back Mary Margaret, Renee, Jenny, and benvenuto a Carmela, and welcome to Jocelyn! Our next update will be Sunday, February 24 -- let's get stitching! Thanks Avis! Your stitch-a-long definitely keeps me motivated! Your progress is quite visible. Beautiful work! Wonderful!It's very important embroidery! Beautiful the colors of pattern! Happy work! Thank you Carmela -- and welcome to the Stitch-a-Long! I think they look watchful more than grumpy! 😉 The swans are going to be so gorgeous when you get to them. The back ground and leaves will really make them stand out. Great progress! I think I must be a bit weird, because I love both outlining and filling in the background... So I think you've done great work, and you're speeding ahead! Thanks Kate! Outlining just seems to creep along without filling in much space. And I usually don't like outlining, but on this project I've enjoyed playing with it a little. 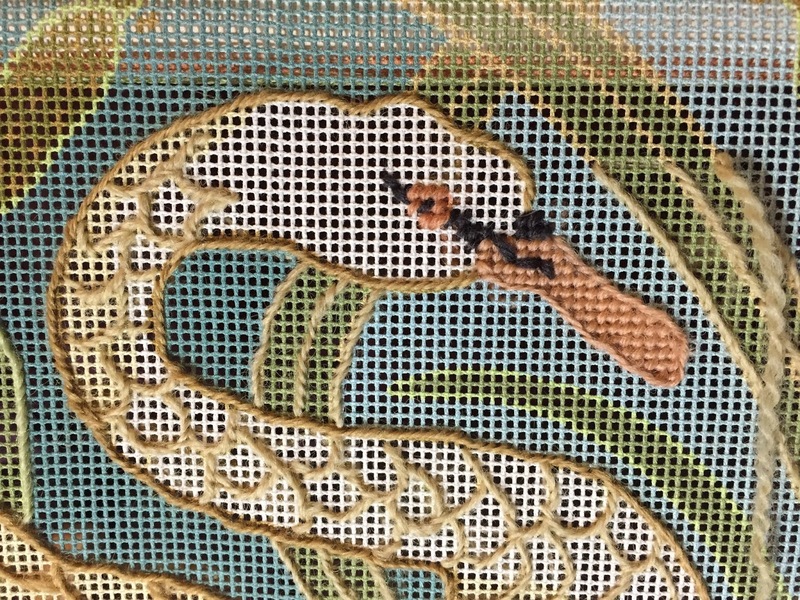 Interested to see your choice of stitching for the head and neck. 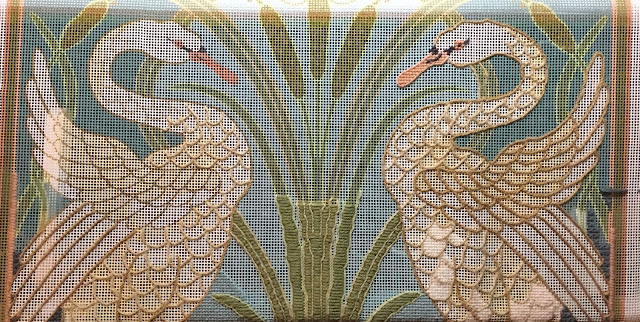 Hi Deborah -- I am thinking a pretty standard tent stitch for most of the swans, though the wings will have some long stitch. I might see what adding a line of "outline" in the white or cream of the feathers will look like on those sections, but I'll need to test it out first. Finishing the outline is a fantastic idea! Filling in will be much faster this way. It's looking great so far, even with mr grumpy swan! Thanks Christina! 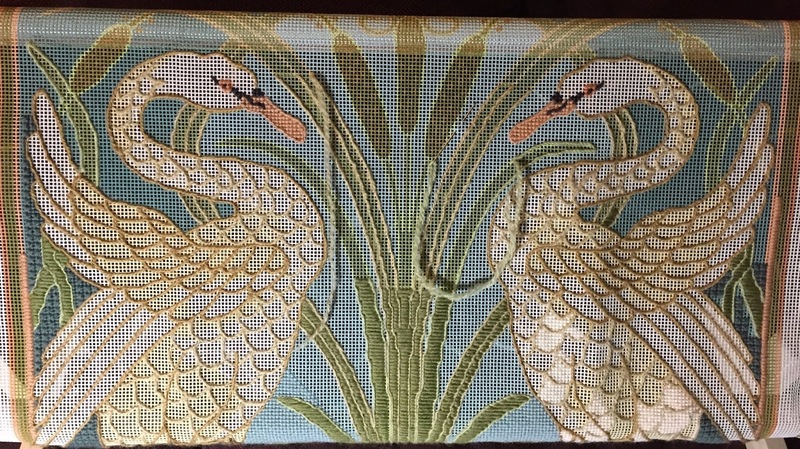 The outlining definitely means that I know the shapes of the swans and leaves -- no decided where to put the next stitch. It's like coloring in, now! Looks like more stitching than I managed this time around. Well done! Thanks Sue! It's funny how sometimes we can really dig in and stitch, and sometimes we can't. I'm hoping for a really productive next three weeks! Thank you for the welcome. 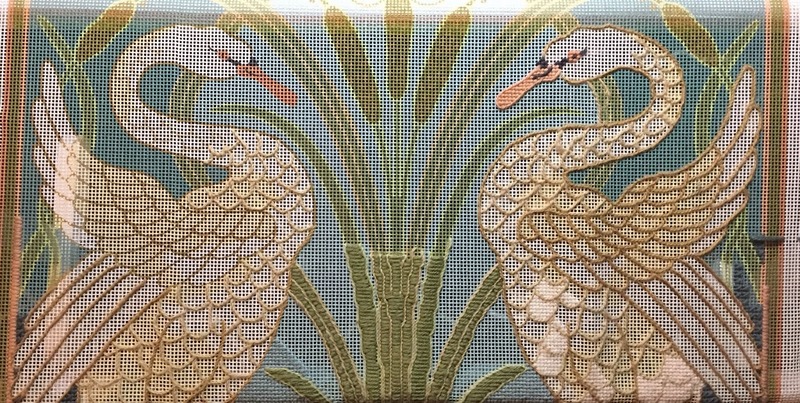 I'm quite taken with this piece...swans are so magnificent and your stitching is lovely. You really got so much done!! I love seeing all the textures in the different areas. The outlining really makes such a difference. Thanks Connie! 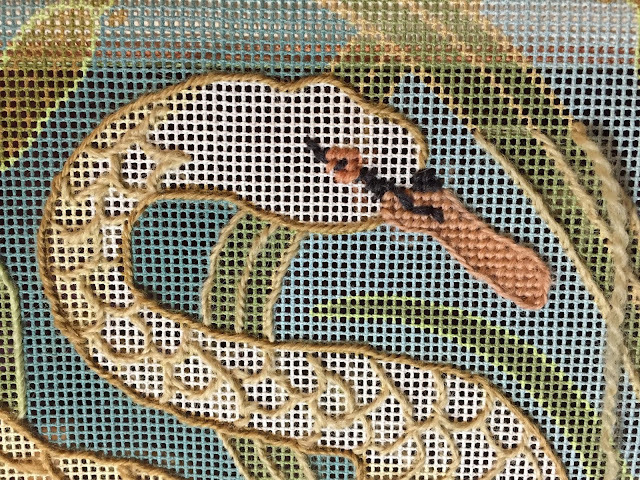 I'm really enjoying this piece -- I've honestly never done different needlepoint stitches, so it's fun to try something new. This is a very beautiful embroidery! it´s interesting to follow your progress, because the embroidery is a bit different from the rest in the group! Thanks Gun! I love that we all work on such different projects. Thanks Margaret! One thing Winter is good for is getting more stitching done! Aww, thanks Carole! I see every time I accidentally change the angle on the outlining -- but isn't that always the case? I have the feeling that this next stretch will have me really turning a corner. This is looking fabulous and to me you’ve done a lot of work on it! Your stitching looks so neat and even a great way to get the outlining in! Thanks Catherine -- it's nice to have some time to really sit down and work on it. Of course, other projects are being neglected, but I'm really enjoying this now. Thanks Linda! I think having the outlines done will make filling in go much faster -- none of that "where shall I make the edge of this go?" question -- I've already answered it! Thanks Jess! I'm happy to report that the outlining is now complete, though I am still stuck on what to do for the cattail heads -- but I've still got some time before the next check-in to play with it a little!